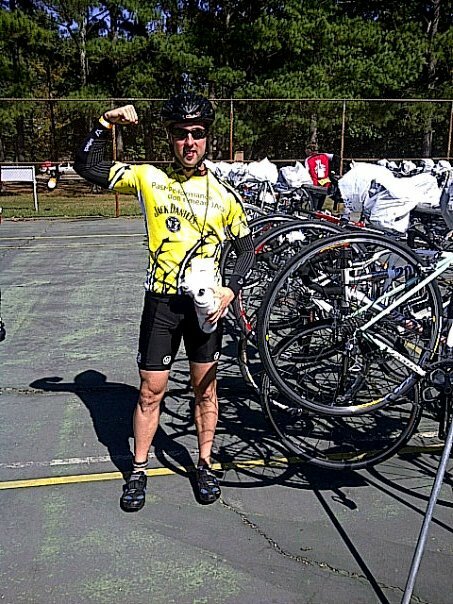 The HUMAN Race: I rode 150 Stinking Miles! 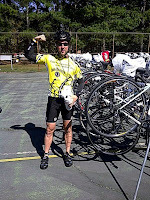 I rode 150 Stinking Miles! 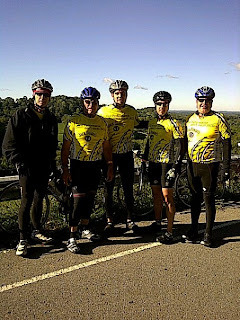 The MS Ride (for Multiple Sclerosis) has been going on for many years. 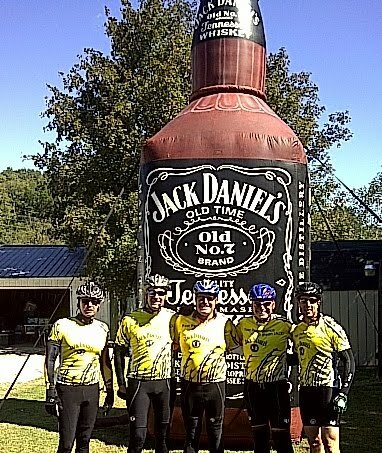 They call it the “Jack and Back” here in Tennessee because you cycle from Nashville to the Jack Daniels Distillery in Lynchburg TN. 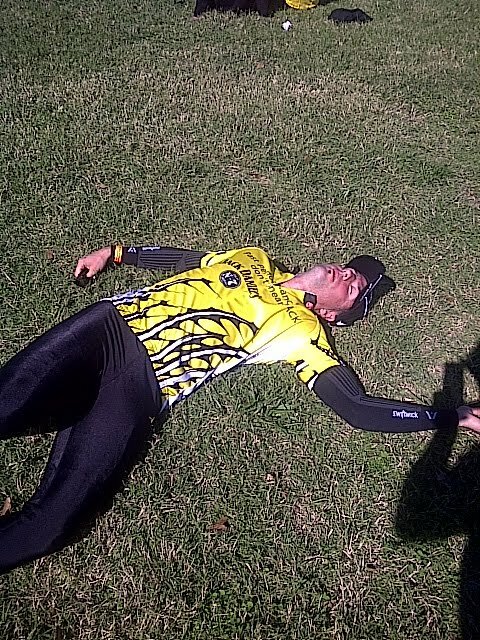 There is a 50 mile route to Lynchburg and a 75 mile route to Lynchburg…. Which one do you think I chose? I’ve cycled around Middle Tennessee for a long time now, and those Country Music singers ain’t lying when they talk about those Hills of Tennessee. I know most of the big climbs, but after a few counties, I got to see some whole new ones. What was even better was that we had two guys from Houston TX with our group and they hadn’t a hill bigger than a mole-hill before. One of the hills of legend around here is one we call Pull-Tight Hill. It’s about a half mile long and straight up, and the view at the top is magnificent. One of the TX riders had owned his bike for years and never even changed gears into his small ring. (For Non-riders: a small ring is used for hill climbing, a big ring is used for flat courses and speed). Just out of principle, he wasn’t willing to change into his small ring, which made it a really hard climb, but he still did it! There were a few other hills like that closer to Lynchburg that I had never ridden before, and I did my best to resist the urge to speed up them because I had another full day or riding ahead of me. Starting out, it was cold, about 45 degrees. That doesn’t sound bad, but when you start riding your bike, the wind drops the temperature drops 10 degrees. I’m usually okay in that weather as long as I can keep my hands and feet warm. If my hands get cold, it just hurts so much. Luckily I planned that part out and it made for a good ride, and as it warmed up we all started shedding layers and getting creative on how to carry our jackets and cold weather gear with us to the finish. 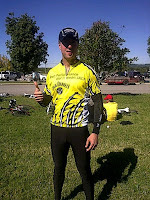 The people who put on the event did such a great job with rest stops every 10-12 miles with food, drinks and more food. They had bike repair tents, massage tents, social gathering areas, music and lots of cheering for the riders. It made it so fun. They had volunteers and police at every corner and intersection telling us directions for 75 miles! They had trucks and cars all over the course in case of emergencies and bike breakdowns. 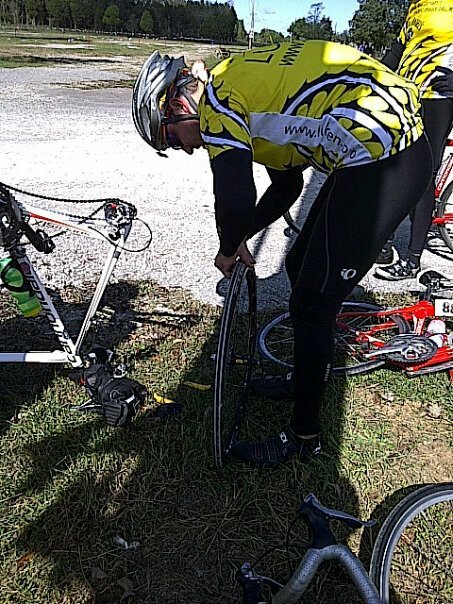 TX-Mike (as we will call him) got a flat tire around mile 35. We had all the gear with us to fix it, but still there were people around for support. Thing was, he had gotten 2 flat tires on that same tire last week. Something was up, but we changed it and moved on. 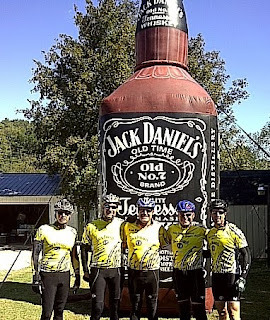 The beautiful ride which ended at Motlow College, just a few minutes from the Jack Daniels Distillery was the final resting place for the evening. Most camp out in tents on the campus, or sleep on blow-up mattresses in the gymnasium, but we really roughed it! We hopped in Greg’s king cap truck and drove to his lake house 20 minutes away on Tim’s Ford Lake….it was really rough sitting in his warm house picking which football game to watch, it was really rough staying awake as I sat outside on the deck listen to the water lapping on the lake, and it was really rough taking my pick of which pillow top bed to sleep on. In the morning we got our bikes and I didn’t anticipate the cold! 36 Degrees. It was cold enough to frost the grass around us, and being the only one in biking shorts getting ready to ride I was beginning to rethink my choices. 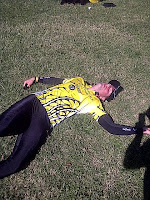 But TX-Mike came through with an extra pair of cycling tights and it was a life saver. He is 6’2” and I am 5’9” and I had them pulled up to my chest, but they did the trick and kept me warm the whole ride. The route took us a different way back to Nashville and somehow no matter which way we rode the wind stayed in our face the whole ride. The wind was relentless. There was a point I was traveling downhill and had to pedal quickly and was still slowing down! Normally the downhill is a rest time when I can coast, drink, eat and pick up some speed and here I was slowing down because of the darn wind. My face was wind burned and I was traveling on average about 4mph slower than usual. Sheesh. While at a rest stop sipping on hot chocolate to warm up, our bikes were sitting with about 50 other bikes and we heard what sounded like a gunshot go off. If you’ve been around biking enough, you know that is the sound of a tire blowing. After many of us (afraid to look) held our breath as we looked over our bike tires…sure enough, TX-Mike’s same tire had blow again. And after calling around to all the bike support vans, cars and trucks, there was only 1 bike tire left on 75 miles of the course. 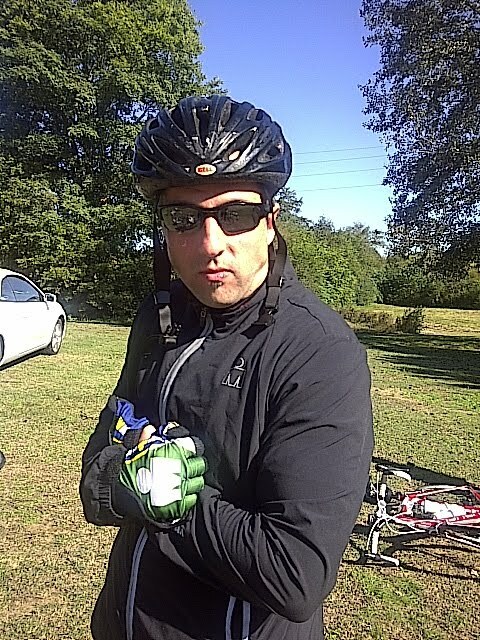 We played the - “Mike drove all the way from Houston TX to do this ride” – card…. And they gave him the tire to finish the ride. Despite the wind and the cold, the weather was perfect blue skies all day and we worked as a Team to finish the ride together. Yes, our legs were tired, our rear-ends were tired, and we all felt pretty worn, there is no better energy than pulling into the finish area with the crowd clapping. They were waving and telling us “THANK YOU! !” for helping to support The Cause to Cure MS. But honestly, we felt thankful to them for giving us perspective and inspiration. We thank them for their strength and attitude to take advantage of each day and live each moment to the fullest. 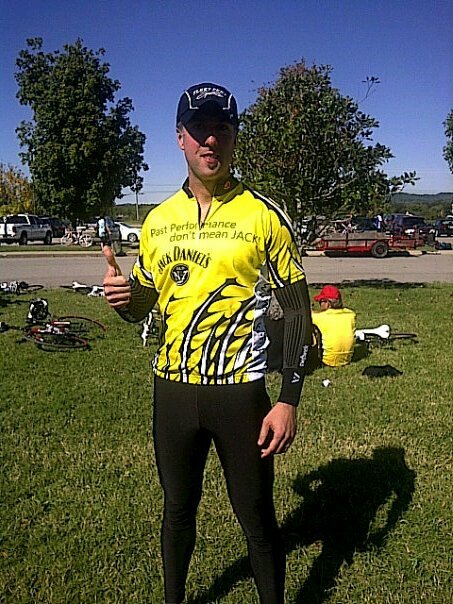 I, in no way, can compare the struggle of a 150 mile bike ride to the struggles of MS. However, if someone with MS can stay positive and hopeful for a cure as they deal with their day-to-day issues, I can draw inspiration from their courage and continue to do my very best in all I do. You can still donate to my fundraising by CLICKING HERE. Nice ride and a great read Chris!